A highly efficient hot water based district heating system serves the downtown core of Calgary and the rebuild in East Village. The District Energy System is one of the cornerstones enabling the redeveloped East Village to be one of Calgary’s most sustainable communities. FVB Energy has been working with the City of Calgary’s utility, ENMAX Energy Corporation, since 2005 to help develop the district energy concept and business plan. The outcome of the study was that ENMAX decided to proceed with the concept of a hot water district energy system, and integrate this with a goal of providing efficient local combined heat and power generation. With the abundance of clean burning natural gas in Alberta combining district heating and CHP is a win/win solution. It improves the CHP cycle efficiency while providing a lower thermal energy price for District Heating. It also produces significant GHG savings associated with the displaced boiler gas in the customer buildings, and the GHG emissions associated with the CHP electrical production are approximately 1/4 of those produced by predominantly coal fired electrical production in Alberta. The ENMAX District Energy Centre located in downtown Calgary on 9th Avenue and 4th Street SE, began operation in March 2010 providing heat to its first customer, the City Municipal building. It now supplies thermal energy to several customers including Bow Valley College’s new downtown campus, the Andrew Davison building and the Hillier Block building. During Calgary’s flood in June 2013, the Downtown District Energy Centre remained fully operational despite significant damage to its basement. This LEED® Silver heat generating facility is capable of providing heat for up to 10 million square feet of new and existing residential and commercial buildings. When fully subscribed the energy centre will be capable of producing up to 60 MW from efficient natural gas boilers with an additional 40 MW from a future off site CHP facility. 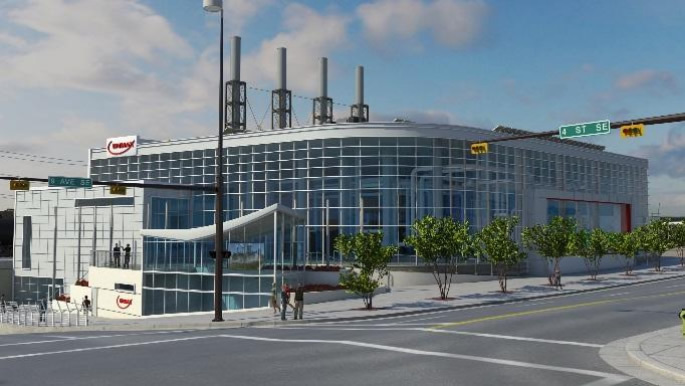 FVB’s involvement included the original feasibility studies, detailed design and construction support for a majority of the buried piping and customer building connections, and Owners Engineer for the central energy centre.